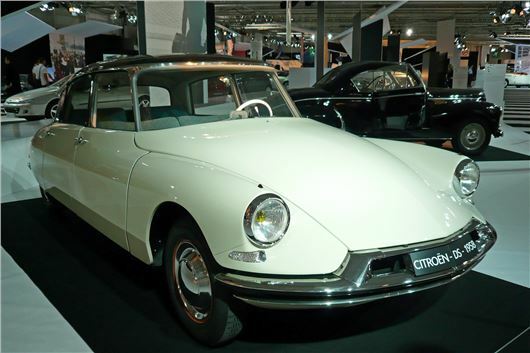 Back in 1955, the launch of the remarkable Citroen DS19 stunned the World. No one had ever seen anything like it. It was a technological marvel that actually looked like one. Now, DS is a separate brand, distinct from Citroen, representing high-end cars available with luxurious, finely crafted interior trim, but without the technical innovations that set the original DS apart and left the unprepared world completely agog. Not only was the DS19 an extraordinary car, it was also an exceptional rally winner by virtue of its unique oleopneumatic suspension. So the first stage of DS celebrations involves Bob Nayrat, a former Monte Carlo Rally winning DS driver, taking a 1966 DS 21 in the 18th Monte-Carlo Historic Rally (28 January - 4 February). Stamped with the DS brand logo and carrying the number 21, the DS will be on the starting line at Reims on 30 January. Additionally the sensational Sebastian Loeb is on the starting grid of the 83rd Monte Carlo rally today, driving a DS3 WRC with the number '60' on the rear wing. This year will see a variety of futher meetings, shows and special events, along with other surprises yet to be announced, in celebration of the DS in its 60th year and first year as a distinct separate brand. DS will be taking part in events dedicated to vintage car enthusiasts, such as Rétromobile (Paris, France, 4 - 8 February) and Techno-Classika (Essen, Germany 15 - 19 April), as well as international motor shows in Geneva (Switzerland, 5 - 15 March), Shanghai (China, 22 - 29 April) and Frankfurt (Germany, 19 - 27 September). The brand will be celebrating the 60th anniversary of the DS with original exhibitions of vintage vehicles, with new vehicles placed alongside the historic DS. DS enthusiasts all over the world will be celebrating the 60th birthday of the DS, as in Belgium (on 26 April) or in Australia (2 and 11 October). One of the main international events, set to take place on 22 and 23 May at the historic Montlhéry track in France, is set to bring together 700 vintage DS vehicles. Between 19 and 22 May, the DS brand will be welcoming representatives of its global network to Paris, the home of DS. On the weekend of 23 and 24 May, the brand will be organising events for the general public in the heart of Paris at the the Tuileries Garden. The 1955 Citroen DS19 was a worldbeater. The DS3 is a great little car. The DS4 can be trimmed out exquisitely. The DS5 is available with Hybrid 4. But please, Citroen, push the boat out. And come up with something that stuns the whole world like the original DS19 did.